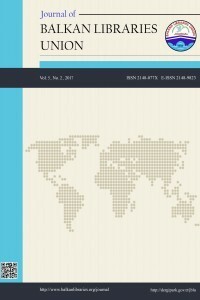 Journal of Balkan Libraries Union (BLUJ) is a double-blind peer-reviewed academic journal covering theories, concepts, models, frameworks, and philosophies in library science, e-publishing, documentation, and information science. BLUJ publishes research articles, review/survey articles, short communications, book reviews, and notes to the editor. BLUJ's scope is broadly library science, encompassing all of the academic and professional disciplines which deal with recorded information. These include, but are not limited to information science, library science, and related disciplines, knowledge management, knowledge organization, information seeking, information retrieval, archiving, human information behaviour, and digital literacy. BLUJ is currently abstracted and indexed in ProQuest - LISA (Library and Information Science Abstracts), Index Copernicus, Ulrich's, DOAJ (Directory of Open Access Journals), Google Scholar, E-Lis (E-Prints in Library and Information Science), CiteSeerX, and J-Gate Portal. It is also under review by other major indexes. BLUJ is published twice a year in May (1st issue) and November (2nd issue) and accepts English and Turkish manuscripts. The manuscripts which are accepted for publication before May are published in the first issue and the manuscripts which are accepted for publication before November are published in the second issue.